However, in about 2005, specialists on weevils split the family Curculionidae and moved the genus Metamasius into a segregated family called Dryophthoridae. After a couple of years they reverted to the previous classification. More than 60,000 species of weevils have been described worldwide, and yet many species are still unknown to science. Most of the yet-undescribed species are tropical, because insect faunas of the tropics are generally more poorly known than those of temperate regions, and because tropical faunas in general are more diverse (have more species). 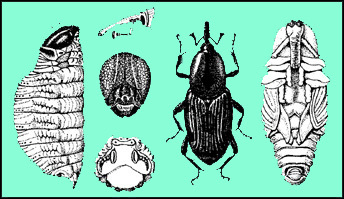 Weevils, just like other beetles, have four developmental stages: egg, larva, pupa, and adult. Larvae and adults feed on plants and on materials of plant origin. Eggs and pupae, of course, do not feed. The developmental time from egg to adult is variable from species to species. However, as in all other insects, they are cold-blooded: unlike mammals and birds they cannot regulate their temperature, and so the movement, feeding, and rate of development depend upon ambient temperature. Thus, up to a point (sub-lethal temperatures), they move, feed, and develop faster at higher temperatures. For this reason they move, feed, and develop faster in summer than in winter in the USA. Some species have only one generation each year in the USA, whereas others have several generations, but with more generations in the hotter months than in the colder months. Many weevil species are specialized in feeding habits: adults and larvae feed on plants of one genus (or a few species of one genus), or sometimes on plants of one family. Very many plant species are attacked by weevils, but relatively few weevil species are considered pests: this is because only those weevil species that feed on plants of economic importance and cause significant damage are considered pests. Most weevil species are innocuous because they have low populations and feed on plants of no particular consequence to humans. Some species are beneficial because they feed on plants that humans consider to be weeds. Some weevil species are highly beneficial because they have been used in biological control of important weeds.